I had no inkling when I met Sev by the i360 to cycle to the Shoreham air show that it would be front-page news tomorrow and at the top of all the news bulletins! It was a lovely day, people were sunbathing on the beaches by Shoreham harbour. We crossed the lock gates and headed into suburbia to cut the corner and avoid the main roads. As we passed the allotments, I could see a jet doing aerobatics, straight ahead. I thought at first it was the Sea Vixen, as it was side on and that was listed to appear just before the Vulcan at 14.05. The aircraft climbed vertically then looped and headed straight for the ground. We didn't see it recover, instead a double ball of black smoke appeared. No sound. Sev switched on his Go-Pro. We stopped to talk to two other cyclists who told us what they saw and we stood for a moment and watched the black cloud with trepidation. We then carried on towards the toll bridge - Sev headed off to Worthing - and some bikers confirmed that it was a Hawker Hunter T7 that had crashed. I took this photo (above), somewhat after the event. We saw the Sea Vixen fly home, and in the distance the Vulcan circling. It did just one fly past and was gone. People started to realise that that was it, and began to drift off. 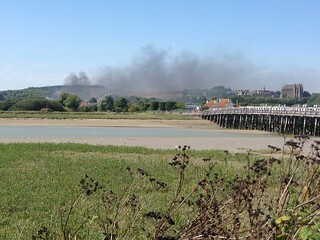 The A27 bridge was gridlocked and the emergency vehicles had trouble getting through. On Facebook they were saying that people had died, including two cyclists. The pilot Andy Hill survived! It'll be a while before we know for sure how many and who. Later, back home, I discovered that it had crashed onto the west-bound carriageway of the A27 near the traffic lights, outside what used to be the Sussex Pad pub, now part of Lancing College. It is apparently the worst air show disaster since 1952, at Farnborough, when a DH110 crashed into the crowd. 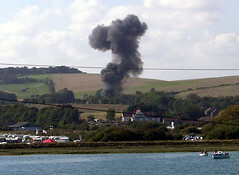 There is plenty of footage of the Shoreham crash on the web, google it. Sunday's display was cancelled. A few years ago, Simeon, Sue, me and others had sat on the verge outside that former pub, but with no clear view of the airfield, and planes flying low right overhead, I decided it was a bit too close for comfort! I preferred standing near the tollbridge. Strangely enough, I also witnessed the Hurricane crash in 2007, which came down at a spot just behind where the Hunter crashed! Saturday 15 August 2015: kipper for breakfast and bus to Mound for the Bailey's Stardust exhibition. David Bailey was a big influence in the 60s, with his grainy 35mm film and cropped heads (tho I believe Bill Brandt invented that). If you like black and white photos and have seen Blow-up, this is the one for you. Got in half price with my art pass. Spent the rest of the day in the Book Festival and at the Pleasance (where they now have a craft beer bar) celeb spotting, including Harry Venning's Hamlet and Millie the champion flyerer. Pakora wrap from Khushi's at George Square. Sunday 16 August: taxi to the Modern Art Museum 2 (the Dean) - there is no Art Bus this year! - for The Amazing World of M C Escher, a fabulous exhibition (no photography!). He too was a big influence on the 60s, tho looked down upon by the art world. He sought to amaze, rather than create beauty. 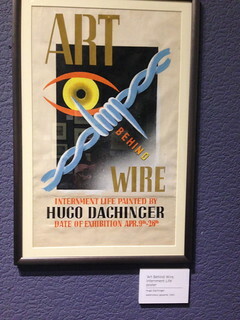 A heady mixture of draughtsmanship, surrealism and maths. 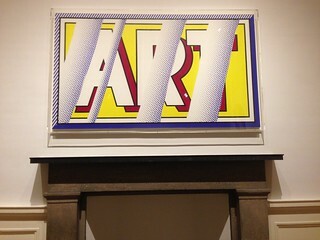 Across the road at 1, there's new work by Roy Lichtenstein and the nicer cafe. Taxi to the Stand for Simon Munnery, 'And nothing But', an unplugged set this year, no projections, no props. 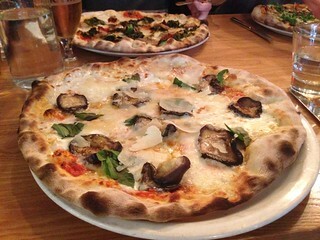 Then to La Favorita on Leith Walk for a huge pizza I couldn't finish, and the Playhouse for the annual Waverley Care gala, featuring Marcus Brigstocke, Adam Hills and many others, then a pint of Elvis Juice at Jeremiah's Tap Room. Monday 17 August: bus to Summerhall and Daniel Kitson's Polyphony, a play for him and 19 iPods with speakers handed out to the audience. A bit like Nina Conti putting words into people's mouths. The iPods were arranged in a circle in the middle of the floor and someone tripped over them! One failed to work once they got going and Dan had to cover for it… meta-theatre at its funniest. One for the Danoraks. Bumped into George Egg and Nikki, then a bit of art at Blair Street hub (bought some nice badges), Fruitmarket and Stills (including a poster by kennardphillipps that turned up at Banksy's Dismaland) - not much art at Summerhall this year. Later on Frankie Boyle, yes him, at the Assembly Rooms. Very offensive in a sort of left-wing way. 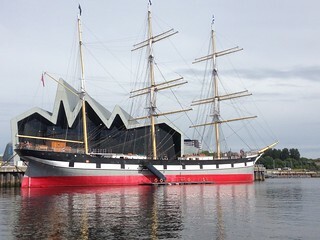 Tuesday 18 August: Trip to Glasgow to see the Riverside Museum. Train to Partick, soup in museum cafe, big South African loco, coffee in tall ship cafe, ferry to Govan and back, 100 bus back to centre, train back to Haymarket, pint in Thomson's Bar, pint in Bennets Bar, sushi at Harajuku Kitchen. Wednesday: home on train sitting next to woman from Deal. 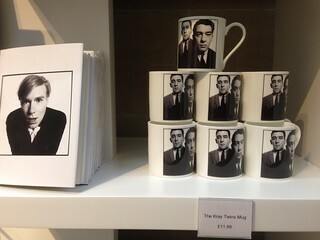 See last year's Edinburgh blog. So far I hadn't used my Go Explore card on a bus! The buses are the one thing on the island that are modern! 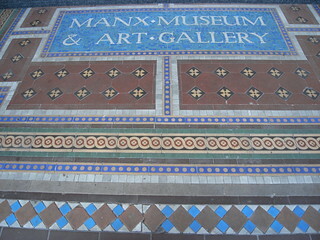 First though I wanted to visit the Manx Museum. I'd been told I'd have to get there in a lift, behind Iceland! For breakfast I had a boiled egg and toast and was told by Paul to go left at Quids Inn (great name for a pub) and look for the lift. In fact I found the lift before I found Iceland, went up to the 8th floor and across a footbridge. The museum didn't open until 10am so I took a seat outside until it did. I wasn't disappointed, the art collection was rather wonderful and contained work by talented interned Germans, and - a surprise - paintings and objects by Archibald Knox, the Arts and Crafts designer. 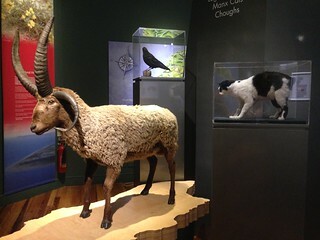 I also saw my first and only Manx cat (stuffed). Then it was down the lift and to the harbour to catch a 6 bus to Peel, on the other side of the island. We saw much rested to the TT course and I must say Peel was very pretty, with a castle, harbour and beaches. 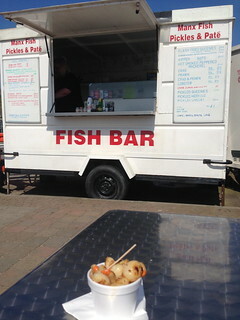 I'd brought a sandwich but a fish stall was selling flash-fried queenies, so how could I resist - a fiver a tub, but well worth it! I had a coffee at the old railway station, discovered that the transport museum was only open on Sundays, and bought a pair of kippers for a couple of quid from the smokery. Back at Douglas I decided to get a bus to Castletown (the station was a way away from the town centre) and after a wander round the harbour and the Old Grammar school had a pint outside the Glue Pot (The Castle Arms). The bus took me right back to the prom, so I had a look at the Gaiety Theatre, spotted the Norman Wisdom statue, and went for supper at Allesandro's (I'd passed it on the way to the Manx Museum) having been turned away from The Italian Job. 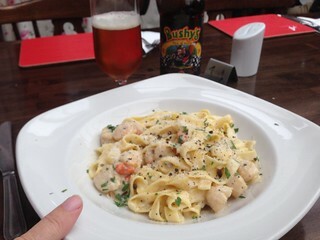 I was going to have pizza but queenies carbonara were on the board as the chef's special so I asked for a meatless one, washed down with a bottle of Bushy's beer! Friday it was up early for my ferry. 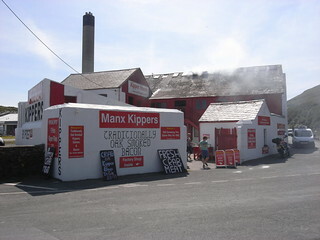 Lisa had made me a packed breakfast so I crept out and walked along the prom where they were setting up a food market. 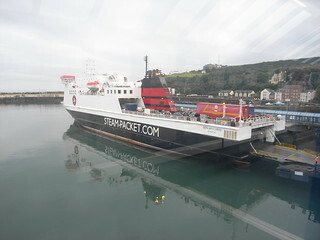 Onto the Ben My Chree (lifts this time!) for the 8.45 passage to Heysham, where we were greeted by the nuclear power stations, and rain! Then it was a train to Lancaster and on to Edinburgh. On Wednesday 12 August, after another full veggie breakfast and lots of tea, I walked to the harbour and along the quay to the Steam Railway station. 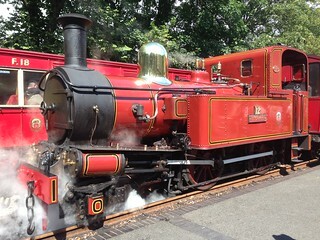 The Isle of man railway is a 3ft gauge railway with all but one of its locos made in Manchester at Beyer, Peacock & Co and all but one 2-4-0T. The odd one out is 0-6-0T No. 15 Caledonia which was built in Glasgow. 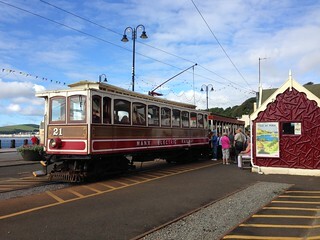 The 9.40 was pulled to Port Erin by No. 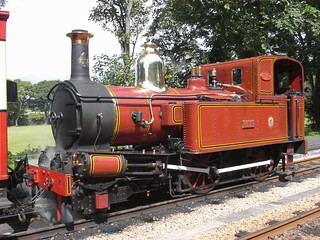 4 Loch, built in 1874 and still going strong. At Castletown we saw the other loco working the line today, No.12 Hutchinson (built 1908) - spot the difference. 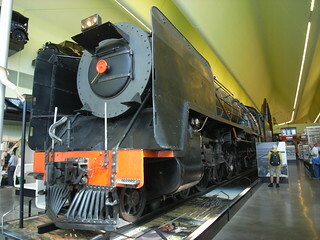 The IoMR is a great example of a nationalised railway, successful because it never modernised. 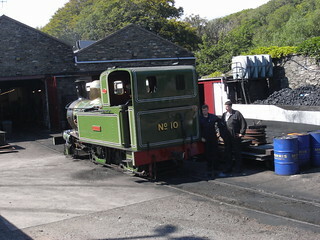 The museum at Port Erin houses two locos: No. 6 Peveril (1875) and No. 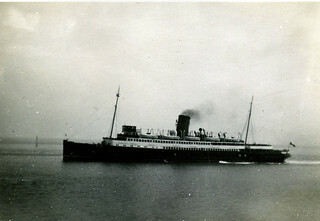 16 Mannin (1926). I bought some old tickets there - £1 for five. I went to look at the bay, checked out a charity shop and wandered back to the station. After a chat with the guard, I decided to go back to Castletown, cross over and get the other train back, which I did. There was a bit of a delay so I was able to take lots of photos with the sun in the right place. Back at Port Erin, I had a coffee and cheese scone at The Sommers, then travelled back to Douglas, where I spotted No. 10 G H Wood (the green one) outside the sheds. One thing puzzled me - where do they keep the coal? There doesn't seem to be much room at the back of the loco! I should have paid more attention in the museum. 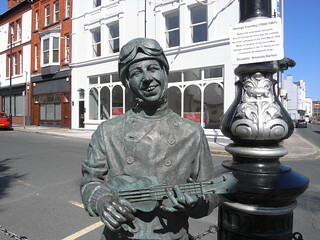 Back at Douglas, I had a wander round, coming across the state of George Formby, went for a pint in The British then to the Little Fish Cafe again. 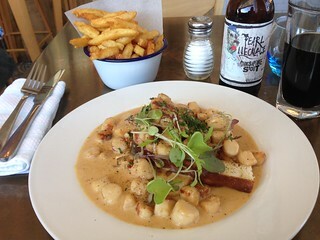 Last night I'd seen someone on the next table with a plateful of queenies (small scallops) and I fancied some. They were on the menu as a starter, with bacon, but I asked the waitress if I could have them without the meat. She said they also did them mains size so I plumped for that, and a bucket of chips! Alas it was too rich and too much and I left most of the sourdough toast. I went back to The British for another pint, then to the B&B to watch French drama Witnesses on TV. 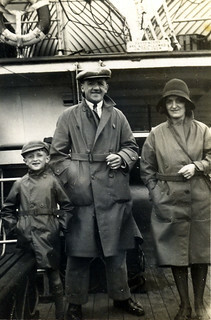 In the 1930s, my dad, an only child, and my grandparents, went on holiday to the Isle of Man, suitably attired for the British weather, probably on a steamer like this below, from Fleetwood. How do I know? Because I inherited the photos. I was determined to follow in their footsteps. So, on Monday 10 August I travelled by train up to Liverpool (spotting A4 Union of South Africa at Crewe) and after a walk round the Walker Art Gallery and a pint at the Welkin, I boarded the Seacat Manannan and set sail for Douglas. Tip: don't waste your money reserving a seat, there are better ones available if you get there early. Warning: lots of steps involved! 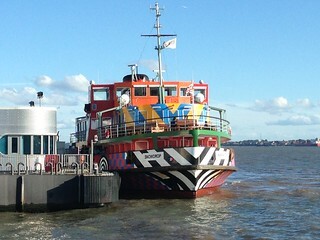 Couldn't get a photo of the catamaran as it was too close, did however get a snap of the dazzle shipped Mersey ferry, designed by Peter Blake. Two and three-quarters of an hour later, we were at the Douglas ferry terminal and it was a short walk along the prom in the dark to my digs Cubbon House, where landlord Paul was hanging around outside ready to carry my case up all those stairs. After a veggie full breakfast in a full dining room, I stepped outside to the Horse Tram stop and with my 3-day Go Explore card (£32, get one!) hailed a tram being pulled by John. The tram lines are in the middle of the road so the conductor has to stop the traffic to let you get on. 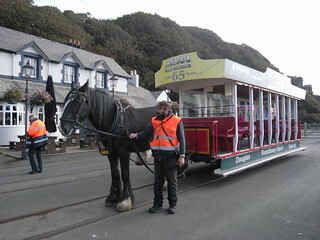 On the way to the Electric Railway, we met a horse being trained and another one close behind. At the terminus I asked for a horse bingo card and got it stamped. Now, when is a tram not a tram? When it's an Electric Railway! This was a tram pulling a semi open carriage. The first train was full so waited for the next one and sat in the open air bit at the back! It was quite a hilly route and a bumpy ride! 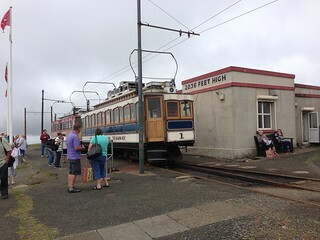 At Laxey I jumped off and straight onto the waiting Snaefell Mountain Railway, which trundled up past the Wheel, past the TT circuit and round the mountain to the summit cafe at 2036 ft high. Back down again - it wasn't very scary, no precipitous drops! - and I waited for a tram to Ramsey, the northern end of the line. There wasn't much to see there - it's a working docks - so I bought some stamps at the PO, some postcards at an ice cream shop and a sandwich at the Co-op, and got the tram back to Douglas. I took a horse tram all the way to the ferry terminal (with Amby) and did a recce for the steam railway tomorrow, via the marina/harbour. 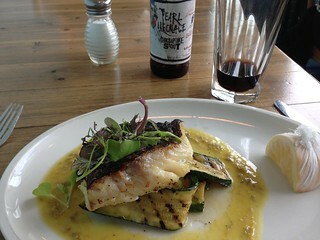 Had a pint of Okell's Saison golden ale outside The British and ate lobster bisque followed by haddock with seared courgettes at the nearby excellent Little Fish Cafe, washed down with a Pearl Necklace oyster stout. And so to my (single) bed. Feeling in need of a steam fix, I hopped on to a 29 bus to Tunbridge Wells, fortified by a giant samosa from Clyde News. After a pleasant 1.5 hour journey we arrived at Sainsbury's just outside the town and after a walk through the car park, bought myself a round trip to Groombridge for £8 (senior). The 14.15 was getting ready to go, pulled by Vulcan Austerity No. 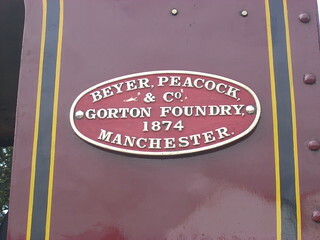 72, in National Coal Board livery… and it was a Wedding Belle special! The wedding party got off at High Rocks and after a few photo ops, we carried on to Groombridge. Here I got off to watch the engine run around, but the whole train took off - to Eridge? it's not supposed to go the whole way on a Thursday? No, it was only a single track in the station so the engine had to do a tricky manoeuvre outside the station with the passengers locked in. Good opportunity for photos however. Then it was back to the base, a quick look round the shed, a bit of shopping at Sainsbury's for my tea, and home.